I’ve made a birthday cake for this darling boy in my son’s class for the past few years. The 13-yr-old is really amazing at baseball and basketball (to name only 2 of the sports at which he excels…he is really very talented) and a few years ago I did this Cavaliers basketball cake for his birthday. This past year he was really into the NY Yankees, so his mom ordered a personalised jersey cake and cookies. 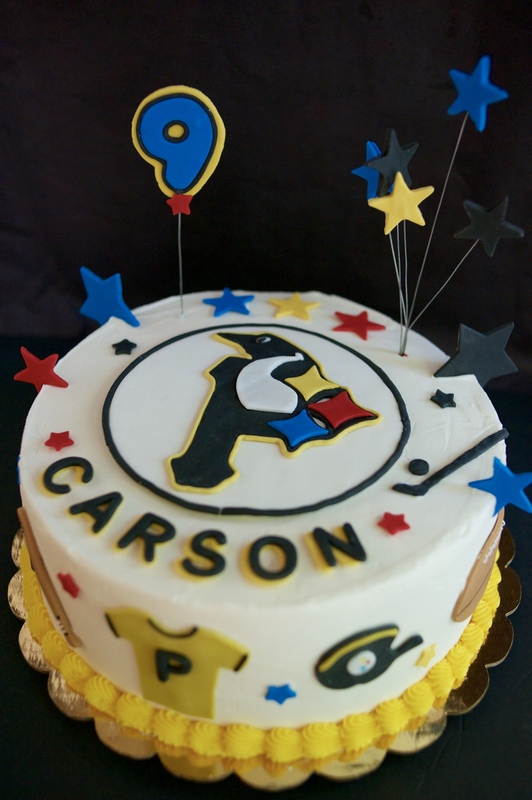 The cake is a half-sheet cookies and cream cake cut to look like a jersey with a pattern similar to this jersey cake. I frosted it in vanilla buttercream and added stripes cut from blue homemade fondant. I used letter cutters to cut out the name and birthday wish; the number 3 and the NY Yankees logo were hand-cut from blue fondant. The baseball cookies were iced with white Royal icing with red lacing piped on for detail. Happy 13th birthday, Anthony….I really enjoyed making your birthday treats again this year! This is a 9″ and 6″ tiered cake with a double chocolate cake on the bottom tier and sour cream almond cake on the top tier and vanilla-bean buttercream filling between the layers. Both cakes are iced with vanilla-bean buttercream tinted blue. The tiara and name plaque are made from homemade marshmallow fondant. The gold on the tiara and letters is painted on using a mixture of gold luster dust and lemon extract…a somewhat tedious task, but one that gives a WOW pop of gold. The blue rosettes piped on the bottom tier are so pretty and feminine. Abby’s mom provided the adorable glass slipper I taped onto the cake board with double stick tape. She also ordered a mix of Cinderella-themed cookies. I love the “Have Courage, Be Kind…” quote she asked to have piped on one of the plaque cookies. While it can be done, I really hate to pipe detailed designs directly onto iced cookies (too much opportunity to mess up a perfectly good cookie). To avoid doing this, I used stiff royal icing to pipe a bunch of slippers and tiaras onto waxed paper, let them dry, painted the tiaras and added some detail, and then transferred them to the cookie while the base coat was still a bit wet. Hope you had a terrific 5th birthday, Abby…it was sure fun making your cake and cookies!! It really was an honor to make this wedding cake for such a sweet couple…I’ve been lucky as I haven’t had any “bridezillas” to work with as wedding clients yet! Since buttercream flowers aren’t my forte, I was happy when the bride told me initially that she was going to use fresh flowers. However, after I made her bridal shower cupcake bouquets, she called to ask if I’d do the flowers on her wedding cake as she hadn’t had any luck finding the flowers she wanted. I agreed, hoping the wedding day wouldn’t be too hot for my buttercream flowers to hold their shape. Now the pressure was REALLY on! As luck would have it, the wedding day was the hottest and most humid in a streak of nice, cool and low-humidity days. But, luckily, the flowers (and cake) held their shape and we got it delivered without mishap! This was a 4-tiered cake with alternating square and round cakes (12″ square, 9″ round, 6″ square, and 4″ round anniversary cake for the top). The flavors were alternating double-chocolate and white velvet layers, filled with vanilla bean buttercream. The flowers were more “rustic” than “realistic,” but that’s just my style. I made them in advance and had them in the freezer until I was ready to decorate. I also made some of the leaves in advance so they’d be “puffy” and easier to place where I wanted them than those piped on. I got this idea (and some of the flower designs) from this great tutorial by Cake Style. In the end, I was really happy with the way the cake turned out. Rustic, but with a bit of traditional sophistication. I also had one of the guests message me to say it was “the best tasting wedding cake she’d ever had…” What more could I ask for a happy ending? Congrats again to you, David and Stacey! It was such a joy to work with you on your special day …Here’s to your happily-ever-after!